The Closet at Shoebox Projects is pleased to present its upcoming exhibit Something Extra by L.A. artist Chelsea Boxwell, whose paintings push boundaries and traditions of the medium. 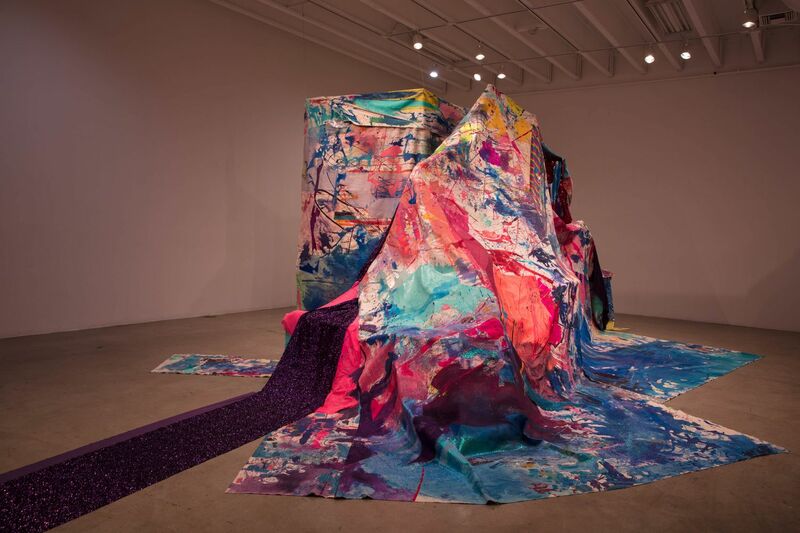 A recent MFA graduate from Claremont Graduate University, Boxwell focused on painting as installation with multi-medias and quite a bit of glitter during her studies. She attempts to transform what painting can be in her work as she now extends her painterly vocabulary within the parameters of The Closet in Shoebox Projects. In this tiny broom closet, Chelsea will attempt to make something quite small and ordinary into something seemingly large and extraordinary. Her interest in alchemy–a derivation from the medieval practice of chemistry created in an attempt to transform base metals into gold–though never officially successful, is both a source of fascination for the artist as well as in popular culture. One definition of Alchemy is "a seemingly magical process of transformation, creation or combination". Boxwell refers to her studio practice as a combination of what transforms and evolves in her studio and gives credit to influences like magic, fantasies, and fairy tales. The so-called ‘fairy tales’ that strike her interest though, are the stories of other worlds, the possibilities of Wonderland, Neverland, OZ or Narnia. Now Chelsea will create her own Narnia in this dark, little closet inside Shoebox Projects, more associated with the simple, contemporary definition of Alchemy; "the ability to transform something ordinary into something extraordinary." The Closet is one of the sister galleries of the newly formed Shed Collective, a group of “alternative to alternative” galleries located in Los Angeles, Ca. These spaces are not your typical run-of-the-mill galleries. They are tiny, located in residential backyards and other unique crevices where very cool and innovative art happens. This concept started out as a joke between the co-founders: Kristine Schomaker, Cathy Immordino, Sheli Silverio and Diane Williams, then recognized how much the art community needs more spaces to show art in fun and non-traditional spaces. So… they made it happen!